One of my favorite things about forty-fives is that they’re straight forward. It’s either hit, or miss. You select a few out of the box at your record store.. Make a stack. Pull up a seat at a record player. And one by one you listen, deciding if what you hear goes into the “yeah” or “nah” pile. But sometimes you get lucky and you hear something that makes you want to run out of the store, go home, and play that record over and over again. There’s not much to know about L.V. Johnson. Born in Chicago, most of Johnson’s career was at Stax records as a house musician. His early career was peppered with a few singles that were pressed on forty-fives, but it wasn’t until the late 1970’s that Johnson started producing albums. 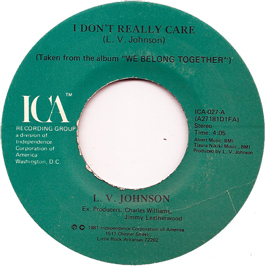 “I Don’t Really Care” is a single of his first long-player, We Belong Together. It’s a carefully crafted love jam that’s slow, but steading moving. The hard drum beat and heavy bass line perfectly contrasted by airy strings and accented by light keys. And Johnson smoky voice sings lyrics meant only for the lover who inspired this baby-making masterpiece. This the kind you groove to. Play this one like it was meant: over and over again. This entry was posted on Saturday, February 13th, 2010 at 9:38 pm	and is filed under Uncategorized. You can follow any responses to this entry through the RSS 2.0 feed. You can leave a response, or trackback from your own site.